Dull (1978). Via Wikipedia Commons. Inoue Shigeyoshi was born in Tokyo and graduated from the Japanese Naval Academy in 1909 and the Naval Staff College in 1924. He was a student in Switzerland, 1918-1920, and naval attaché in Rome, 1927-28. 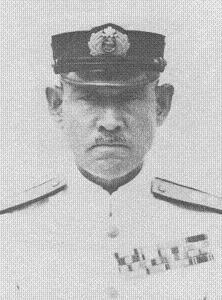 After serving as captain of battleship Hiei, he was promoted to rear admiral in 1935 and to vice admiral and command of China Area Fleet in 1939. The third member of Yamamoto's Treaty Faction within the Japanese Navy, Inoue shared Yamamoto's misgivings about war against the United States as well as his faith in air power. As a result, he was "exiled" in August 1941 to command of 4 Fleet, Japan's smallest, for bluntly stating that the Japanese fleet was not a match for the U.S. fleet. It is reported that Nagumo, an ardent supporter of the Fleet Faction, once made a veiled threat against his life at a garden party, commenting on how easy it would be to slip a knife up between his ribs. During his tenure as chief of naval aviation, in 1940, Inoue also offended many traditionalists by declaring that the construction of super-battleships was a blind response to American building plans rather than a rational policy. He argued that the advent of submarines and aircraft had turned the naval battleground into a three-dimensional arena, and that strategic and tactical thinking must adjust accordingly. His most radical suggestion, made in January 1941, was that control of the western Pacific could be achieved by land-based aircraft alone. This made Inoue something of a Japanese Billy Mitchell. He shared with Yamamoto the belief that the Americans would avoid the Great Decisive Battle that dominated Japanese naval strategic thinking and that the war would become a protracted war of attrition. However, he disagreed with Yamamoto on the merits of the Midway operation, which he strongly opposed. Inoue was made the scapegoat for the strategic defeat in the Coral Sea in May 1942, and, after failing to heed intelligence warnings about the Allied landings at Guadalcanal, he was sent to command the Naval War College in October 1942. Towards the end of the war, as he began to come back into favor with the Navy hierarchy, he became Navy Vice Minister on 5 August 1944. He used what influence he had to push for peace. Inoue was warmhearted and highly intelligent. He was also an original thinker whose realism about the world balance of forces was simply not welcomed by the Navy hierarchy.